Contrary to popular belief, bunions are aggravated, not caused, by shoes. They usually are the result of inherited faulty foot mechanics that put abnormal stress on the front of the foot. Women significantly outnumber men among bunion patients, because wearing high-heeled or pointed-toed shoes aggravates the condition. Spending long periods of time on your feet can also make the condition worse. Despite significant improvements in diagnosis and treatment in the last 30 years, the number of bunions seen by foot and ankle surgeons continues to increase. 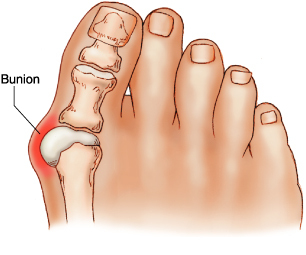 Because bunions are a progressive disorder, it is best to see a foot and ankle surgeon for diagnosis and intervention that can correct the problem before severe pain and deformity can occur. Pain from a bunion can be mild, moderate or severe, making it difficult to walk in normal shoes. The skin and deeper tissues around the bunion may be swollen or inflamed. Other toes can be affected, too, from pressure applied by the movement of the big-toe joint against them. Bunions usually get worse over time. Other toes can be affected, too, from pressure applied by the drifting of the big toe joint. Toenails may grow into the side of the nail bed, corns can appear, and toes may bend upward to form hammertoes. 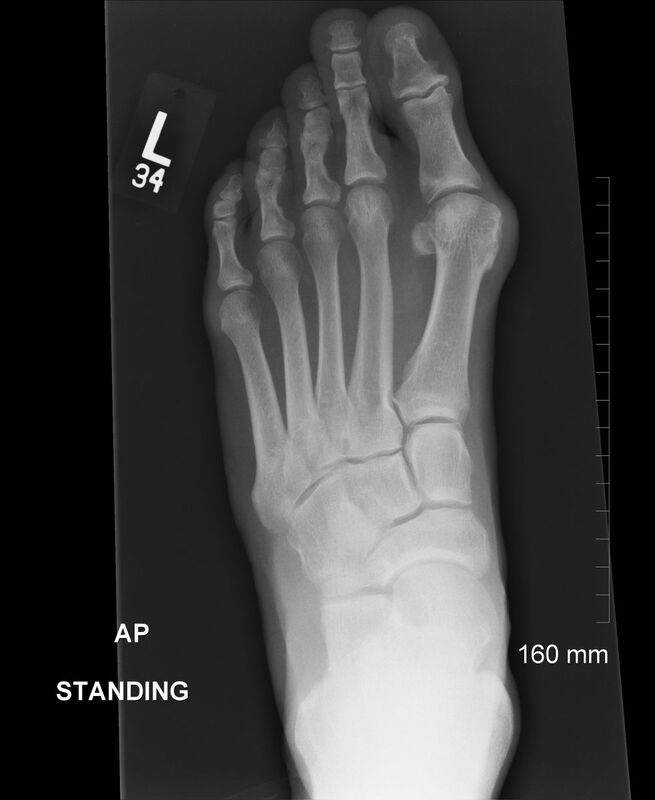 Diagnosis involves a clinical examination of the foot and lower extremity in weight-bearing and non-weight-bearing positions, as well as a radiographic examination of the deformity. Early treatments are aimed at easing the pain of bunions, but they do not reverse the deformity. Pressure is lessened by padding the joint, wearing comfortable shoes or shoe inserts. Anti-inflammatory drugs and ice may be recommended for relief of pain and swelling. Activities that cause bunion pain should be avoided. Note: Please ask your doctor before starting any new medications. When the pain and deformity of a bunion have progressed beyond the limits of non-surgical treatment, surgery may be recommended. The foot and ankle surgeon selects the procedure based on the patient’s age, activity level, and the degree of the deformity. Following surgery the patient usually wears a surgical shoe or cast. Surgical videos can help show what is technically performed during the bunion correction. The ultimate goals of bunion surgery are to relieve pain, correct the deformity and restore function. Adherence to post-operative instructions from the foot and ankle surgeon is critical for a successful outcome. The length of the recovery period will vary, depending on the procedure or procedures performed. Contact one of the doctors at Academy Foot and Ankle Specialists is you have an aggrevating bunion to find out what treatment options are best for you!